Out of the ordinary luxury comes to the Bahamian out islands with the introduction of a magnificent oceanfront Resort, Sandals Emerald Bay. Civilized pleasures go hand in hand with exotic adventures. Partnering classical elegance and sophistication with a sense of tranquility, Sandals Emerald Bay will offer guests an experience that extends hospitality to boundaries never seen before. 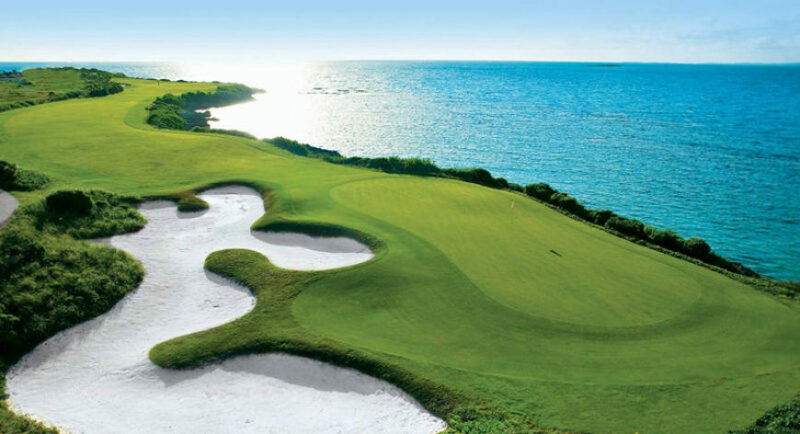 An 18-hole, 7000 yard, par 72 Greg Norman Designed Golf Course featuring six breath-taking Oceanfront holes on a peninsula. Three fresh water pools including the Caribbean’s largest zero entry pool with a central fire pit. Seven exciting Discovery Dining options to choose from. Magnificent Red Lane Spa facility encompassing 16,000 sq. ft. with 16 relaxing treatment rooms. 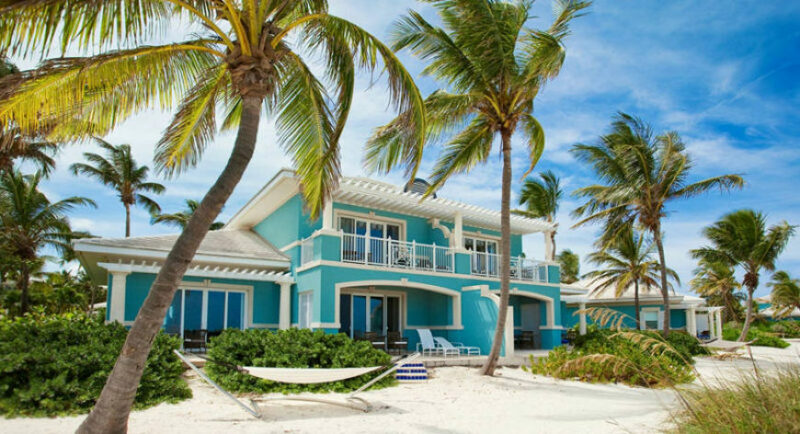 Sits on one mile of one of Exuma’s best powdery white sand beaches with a panoramic view of Emerald Bay. Over 9,000 sq. ft of covered banqueting and convention facilities. 6 Har-Tru tennis courts including a sunken stadium court. 249 rooms & suites, 21 Categories sitting on 500 acres. 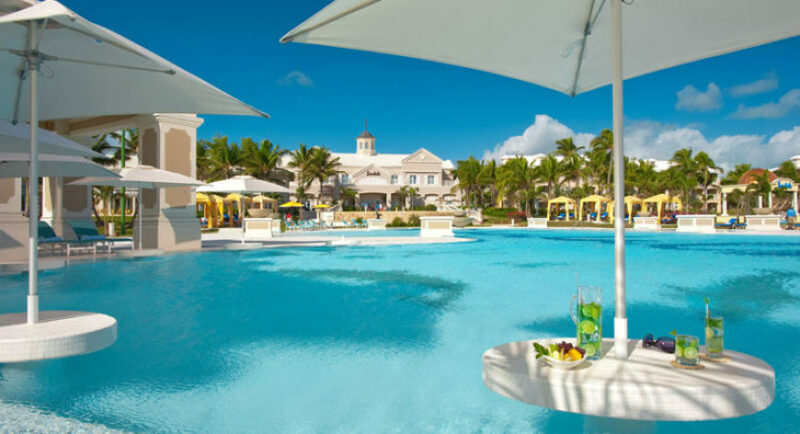 Sandals Emerald Bay offers classic contemporary accommodations reflecting magnificent Bahamian architecture. Best of all, each and every accommodation is either located directly on the beach or just a short stroll away. This alluring beachfront hideaway includes the low-rise, high style Beach Houses, sumptuously appointed rooms and suites nestled amongst manicured lawns, vibrant bougainvillea, and coconut palm trees. The epitome of island living, the exclusive seaside villas—including the one and only Royal Estate Villa—offer expansive elegantly furnished suites that are located directly on the silky white Emerald Bay beach. The accommodations at Sandals Emerald Bay are so elevated; they all begin at Club Level. And nearly half of the resort accommodations include Butler Service. Down duvets and pillows; personal pillow menu; flat screen televisions with cable connections; DVD players on request; electronic in-room safe; hairdryer; emergency overnight toiletry kit; lighted makeup/shaving mirror; luggage rack; individual temperature control; robes; iron and ironing board; smoke and heat detectors; night lights; two-line speaker phones with data port and I-home deck with an alarm clock. All suites includes double marble vanity sinks, glass enclosed shower and a deep soaking tub. Bed is lower than standard height, rails in the bathroom and face basin can Accommodate wheelchair. Available on request: shower bench & extended showerhead..
For those seeking the rarified indulgence of authentic beachfront luxury, these extraordinary villas suites deliver just that. There are few other places where you can you step from your sumptuously appointed accommodation directly onto a patio that gives way to a white sand beach. Embraced by modern island elegance, this sprawling suite is a true beachfront retreat, with the added pampering of your very own butler. It boasts an elegant entrance hall leading to a large living room opening to the private furnished patio and the white sand beach. Thoroughly contemporary island-inspired furnishing are found in both the living room and the spacious bedroom. It truly is an extraordinary place to celebrate your honeymoon or anniversary. Revel in the ultimate beachfront vacation, in a magnificent villa suite directly overlooking the sea. With the sophistication of a colonial manor and the stylishness of contemporary appointments, this oversized villa suite is its own privileged sanctuary with your very own butler, where you can walkout directly onto your patio and the white sand beach beyond. Natural stone floors feature custom area rugs that accent handcrafted mahogany furnishings and British Colonial touches, with a spacious seating area and a dining table for two. Found on the ground level, these suites open to a furnished, private terrace adjacent leading to the silky white sand beach. The ultimate indulgence for those seeking a true beachfront vacation, these oversized suites come with every luxury, including the services of your very own butler. With a nod to the casual elegance of the Bahamas, these 1-bedroom suites boast elegant entrance halls leading to large sitting rooms off a luxurious master bedroom. With two full marble bathrooms, this is a versatile space full of style and comfort. This sanctuary comes complete with furnished private terrace that opens to undisturbed views of the white sand beaches and crystal clear turquoise waters of Emerald Bay. This true beachside hideaway is a sumptuous study in island elegance, where you can walkout to the resort grounds and enjoy the magnificent seascape right before your eyes. Designed for those celebrating their marriage, be it a honeymoon or special anniversary, every details lends to a tranquil yet sophisticated ambience, from natural stone floors and custom area rugs, to mahogany furnishings and British Colonial accents. Your butler will pamper you with attentive yet-unobtrusive service, making your special occasion even more spectacular. Sliding glass doors open to a furnished, private terrace and the silky white sand beach beyond. Celebrate this special time of your life in a suite designed to mark the occasion. The warm, natural hues that adorn this spacious suite perfectly blend with the seascape outside your window—from the sand-colored natural stone floors, to the elegant blue accents that match the sea. Handcrafted mahogany furnishings with British Colonial accents add an elegantly dramatic counterbalance, while your butler will pamper you with attentive yet-unobtrusive service. Located on the second floor, each suite opens to a furnished, private balcony with views of beach and the sea. Descend the stairs in the front of your villa, and the alabaster beach is just a few steps away. Echoing the sophistication of a colonial manor, each oversized villa suite is its own beachfront hideaway, where you can walkout directly into the extraordinary landscape and stroll to the beach. Natural stone floors feature custom area rugs that accent handcrafted mahogany furnishings and British Colonial touches. You’ll experience true pampering with a butler who will attend to your every need, in a suite that opens to a furnished, private terrace adjacent to the silky white sand beach of Emerald Bay. Immerse yourself in the luxury of a true Bahamian lifestyle in a suite that’s a sophisticated retreat, with floor-to-ceiling windows that bring the outdoors in. Enveloped by a natural palette, appointments like stone floors, custom area rugs and handcrafted mahogany furnishings are enhanced by British Colonial accents. Your very own butler will attend to your every whim and need, ensuring your vacation is everything you want it to be. Located on the second floor, a furnished private balcony offers magnificent views of the sea. Descend the stairs in the front of your villa and the sand will be underfoot in merely a few steps. Showcasing the spirit of island living, these luxurious suites let you step out into the Exumian landscape, where the white sand beach is just a few short steps away. Spacious, graceful and contemporary with separate bedroom and living room, these ground-level suites are beautifully furnished with the upmost attention to detail. Each one-bedroom suite offers a King-sized mahogany bed and a separate parlor, along with a butler to attend to your every need. Elegant furnishings are juxtaposed with modern amenities in a suite designed for dining and entertaining, with sliding glass doors that lead to a private, furnished patio. Revel in the beauty of your ocean view in these stylishly elegant and supremely comfortable 1-bedroom suites. Appointed in a classic style with sumptuous fabrics and mahogany furniture, these suites feature a spacious bedroom, comfortable sitting room and an entrance hall that make these suites perfect for guests who desire space and privacy. Located just a short stroll away from the crystal-clear cerulean waters of Emerald Bay, each suite features Sandals’ elite Butler Service and opens to a furnished, private balcony with magnificent views of the sea. Found in magnificent locations on the first floors of the Ocean and Emerald Villages, these Club Sandals suites incorporate a spacious bedroom with king size bed, sitting and dining area and a top-of-the-range plasma television all complemented by stone floors and exquisite area rugs. Outside one finds a private patio complete with teak seating area and direct walkout access to the beach, ocean and the resort’s lush tropical gardens. A stylish marbled en-suite bathroom featuring a walk-in shower, oversized bath and ‘his and her’ sinks make up this tranquil hideaway. With mesmerizing views of the turquoise blue sea, each oversized junior suite is a model of Bahamian luxury, awash in muted tones and fine textures. Floor-to-ceiling windows framed by plantation shutters infuse the suite with natural light and magnificent views of the outdoors. Natural stone floors are accented by custom area rugs and handcrafted mahogany furnishings with a few British Colonial flourishes. Located on the second floor, just a short walk from the beach, these accommodations open to a furnished, private balcony with views of the sea, lush, tropical gardens and resort grounds. Guests in these accommodations are afforded the elite services of Club Sandals, concierge service for the 21st century. A sophisticated sanctuary, each oversized junior suite is a model of contemporary luxury, with floor-to-ceiling windows that frame the beautiful landscape outside. Natural stone floors feature custom area rugs that accent handcrafted mahogany furnishings, plantation shutters, and British Colonial touches. These junior suites are located on the first second and third floors, just a short stroll from the crescent-shaped Emerald Bay Beach. The sliding glass doors open to a furnished, private balcony with views of the lush, tropical gardens and resort grounds. Guests in these rooms enjoy private membership to Club Sandals, concierge service for the 21st century. With a stunning view of the ocean, these oversized retreats offer a natural, luxurious ambience just steps from the sea. Elegant mahogany furnishings and natural stone floors offer a fresh take on a classic Bahamian style, with floor-to-ceiling sliding glass doors and plantation shutters that showcase the magnificent landscape outside. Located on the second and third floors, just a short stroll away from the sparkling Emerald Bay Beach, each room opens to a furnished, private balcony with views of the lush, tropical gardens and resort property. Guests in these rooms enjoy private membership to Club Sandals, concierge service for the 21st century. With magnificent views of the sparkling sea, these oversized retreats offer a natural, luxurious ambience just steps from the sea. Lavishly appointed with rich mahogany furnishings, natural stone floors and plantation shutters, these rooms exude Bahamian sophistication. Sliding glass doors lead to a private, furnished patio with views of the lush, tropical gardens and resort grounds. In addition, guests in these rooms are afforded the elite services of Club Sandals, concierge service for the 21st century. Designed for True Island living, these ground floor rooms let you open your doors and walk straight out to the resort property, steps from the pristine beach. 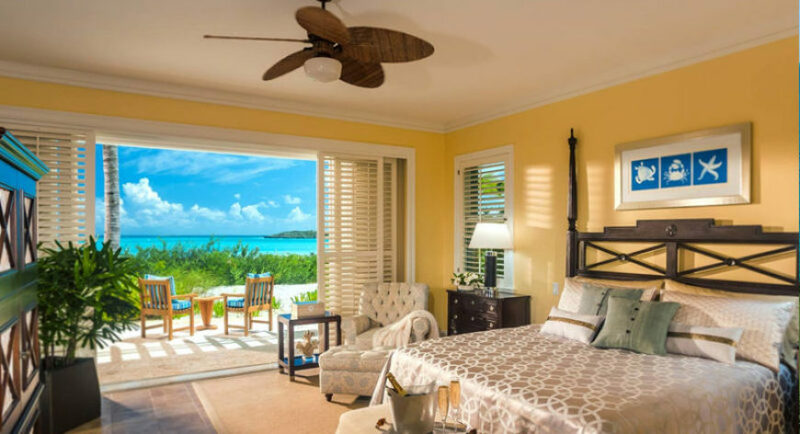 Appointed with rich mahogany furnishings, natural stone floors and plantation shutters, these rooms exude Bahamian sophistication. Sliding glass doors lead to a private, furnished patio with views of the lush, tropical gardens and resort grounds. In addition, guests in these rooms are afforded the elite services of Club Sandals, concierge service for the 21st century. With rich mahogany furnishings and impressive natural stone floors, these rooms exude a warm, British Colonial feel. Floor-to-ceiling sliding glass doors with plantation shutters bring the beautiful outdoors inside. Located on the second and third floors, just a short stroll away from the sparkling Emerald Bay Beach, each extraordinary room opens to a furnished, private balcony with views of the lush, tropical gardens and resort grounds. Guests are afforded the elite services of Club Sandals, concierge service for the 21st century. Sandals Resorts creates culinary experiences that take one on a global journey of delectable discovery. With numerous distinctive types of cuisine, one can discover sumptuous regional specialties, with each one delivering a new cultural flavor. Resort Evening Attire: Dress pants/ trousers or jeans for men, long or short sleeved dress shirts, (with or without Collar) dress shoes or elegant sandals. No shorts, t-shirts, sleeveless shirts or sneakers. Comprehensive buffet breakfast featuring delicious made-to-order omelets and refreshing smoothies. Set on a spectacular location on the soft white sands of one of the Caribbean’s best beaches, Barefoot by the Sea’s charm and ambience is unmatched. Here, you’ll dine on the freshest seafood fare. Dress Code: Resort Casual Attire however bare feet are accepted. Enjoy our luxury café where you can satisfy your sweet tooth. Opening hours: 6:30 a.m. -10:00 p.m. Bite into crisp gourmet pizzas, expertly prepared in our wood-fired oven and laden with your choice of delectable toppings, from savory prosciutto with roasted red pepper to sweet banana with gorgonzola. Dress Code: Resort Casual Attire. The “sky” (as its name implies) is certainly the limit when it comes to the genuine Italian experience evident in every delicious dish. The charming atmosphere, along with every dish, emanates the Italian’s warm-hearted philosophy of life and food. Dress Code: Resort Evening Attire for dinner and Resort Casual for breakfast. Cross the Atlantic the instant you enter this authentic British Gastro Pub, complete with carved wooden walls, rich wooden benches and a clubby billiards room. Sample the best traditional pub fare this side of the Pond. Club Sandals 7:30 am-10:00 p.m. Guests at Sandals Emerald Bay are treated to an array of entertainment, including dance lessons, introductory golf and tennis lessons, live music, jazz performances and pianists. Guests looking for a slower pace can also browse the Resort’s classic library, boasting historical information on The Bahamas and Great Exuma. To enjoy the beautiful Caribbean weather, the Resort offers outdoor games and activities including volleyball, horseshoes, outdoor checkers and chess, bocce ball, croquet, billiards, cards and board games. Sandals Emerald Bay offers a comprehensive array of water sports including kayaks, windsurfing, hobie cat sailing, paddle boats, guided snorkeling tours and scuba diving. Unlimited Scuba Diving for certified divers. To complement its sublime ocean views, the resort has three pools including a brand new freshwater pool. 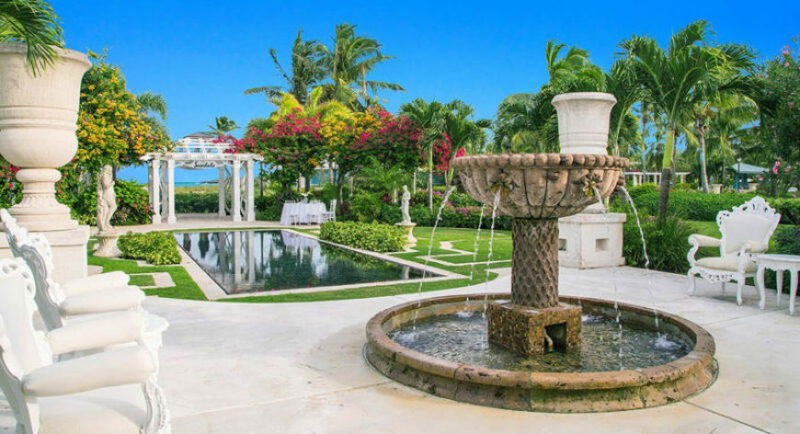 Encompassing over an acre, this spectacular pool will entice guests with a Jacuzzi, swim-up pool bar, a unique fire pit feature and complimentary poolside cabanas with misters. Red Lane Spas offer classic European Spa services with a distinctive Caribbean flair, using all-natural organic products made from nourishing tropical ingredients. The Tropical Nail Bar offers a shimmering palate of eco-vegan nail lacquers and glistening Shellac nail treatments. Open daily from 9am to 7pm. Conveniently located near the Red Lane Spa®, an enclosed modern air-conditioned fitness center offers state of the art Life Fitness cardiovascular and strength equipment for optimal workouts.